Upcoming Tata Micro SUV (Smaller Than Nexon) Accidentally Teased? Home Cars News Upcoming Tata Micro SUV (Smaller Than Nexon) Accidentally Teased? Tata Motors are using two brand new platforms in the development of future vehicles. The upcoming vehicles starting from Harrier premium SUV will be underpinned by either ALPHA or OMEGA architecture, as the former is responsible for cars up to 4.3-metre length and the latter will address cars of above 4.3-m length. Next year, the homegrown automaker is debuting Impact Design 2.0 design language on the Harrier and 45X Concept based premium hatchback. They will set the stone for more vehicles’ arrival as Tata embarks on introducing models in the existing segments, while inventing new ones under Turnaround 2.0 strategy. During the official presentation of the H5X and 45X concepts at the 2018 Auto Expo in February, Tata did give a sneak preview of what’s cooking under the curtain as the new platforms were showed giving way to six vehicles including the production versions of aforementioned concepts. 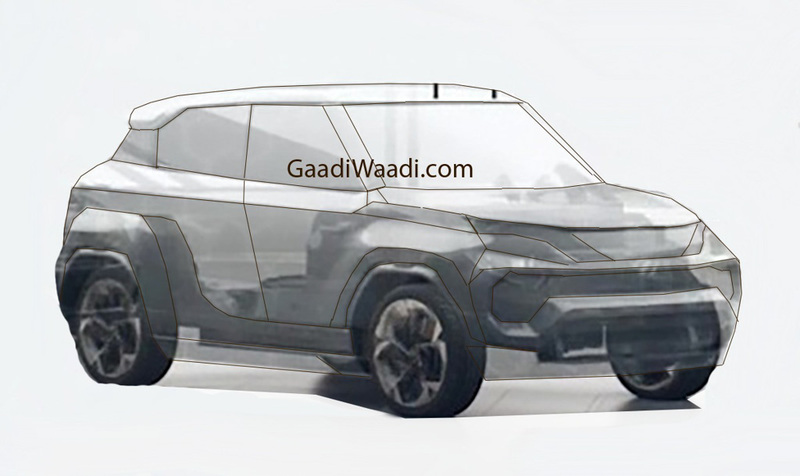 The ALPHA or AMP (Advanced Modular Platform) will likely be spawning a micro SUV reportedly dubbed Hornbill and it will be positioned below the successful Nexon subcompact SUV. Codenamed Tata X445, the representational image of the micro-SUV gives away its rather upright styling. It is expected to compete against the likes of Mahindra KUV100 and Concept Future S based Maruti Suzuki small SUV. The Tata Hornbill boasts large wheels, high ground clearance, front styling inspired form 45X but in a compact way, raked windscreen, floating roofline, tall pillars, roof-mounted spoiler, edgy bumpers, etc. The powertrain options will be adopted from the best-selling Tiago with manual and AMT transmissions and the engines will be tuned to comply with BS6 emission norms as its launch timeline could be sometime by the end of this decade or in early 2021. It also means several standard safety equipment can be expected to featured.